Bulk SMS Software - Professional sends instant short text messages from PC to thousands of recipient’s mobile phones via using Microsoft Windows or GSM technology based phones. 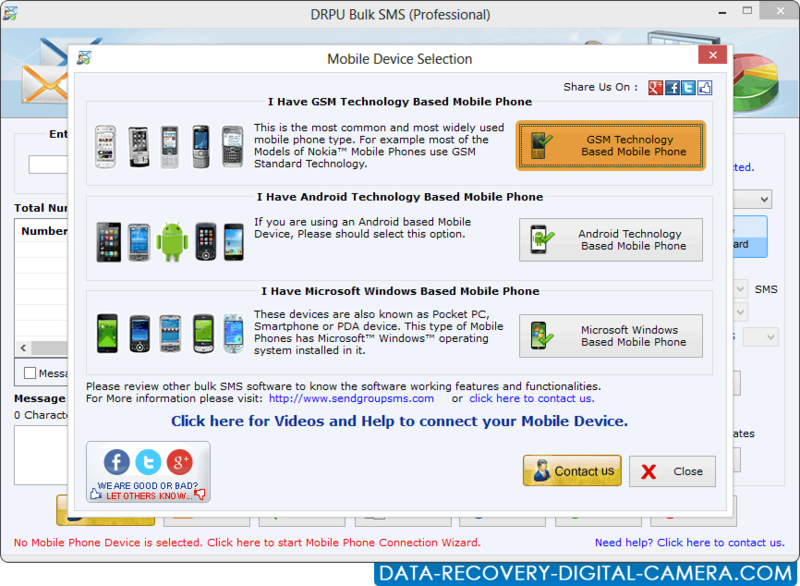 Bulk Text messaging tool makes it easy to send hundreds of sms right from your PC. Bulk messaging software establish communication with bulk people that may include your clients, business partners, customers, friends and family members. Connect your desktop or tablet PC and your Windows Mobile powered device to transfer information, settings, and files. Synchronization is handled with different applications for Windows XP, Windows Vista and Windows 7 or higher, so please check which operating system your PC is running. Broadcast multiple instant text sms. Works with major Microsoft Windows, GSM as well as android technology based mobile phones. No internet connectivity required to send bulk sms. Simple mobile phone connection wizard (with no additional resource required). Send sms in standard or notification format as required. Advance option to skip duplicate number entries and easily fetch list of contact details from phone memory.